Your IRS Tax Collector has much more power than the average federal employee. It’s a common misunderstanding that the IRS is an entity you can avoid. Although it may seem like a brilliant idea to not pay your taxes, avoid the IRS, and use all the “extra” cash you have to live your life, it’s a horrible idea. 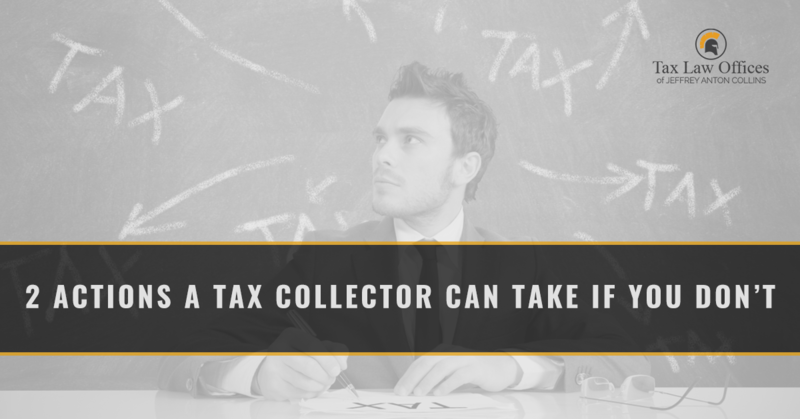 Not only will a tax collector pursue you, but they will go as far as contacting your family members, friends, and work colleagues to collect what you owe. If you’re being contacted by a tax collector and don’t know how to handle the situation, give our IRS tax attorneys in Naperville a call. Otherwise, Tax Law Offices will share two actions an IRS tax collector can take to settle your tax debts. If you fail to pay your taxes, the federal government can file a tax lien against your property, assets, and real estate. The lien is filed to protect the government’s interest against your property and assets. However, the government must follow a set of specific steps before they can file a lien. They must assess your liability, send you notice for demand of payment, and allow you a defined time period to make the payment. If you do not make the payment for whatever reason, you will have a tax lien filed against you, alerting the appropriate creditors that the government carries legal right to your property and assets. A tax levy is the legal seizure of your property, assets, or finances to pay a tax debt you owe. Levies differ from liens in that the levy is the government taking your property and assets to pay your debt, while a lien secures the government’s interest against the property or assets. If you’ve gotten yourself into a situation where the government is levying your real estate, vehicles, or wages, call Tax Law Offices today. The IRS must take specific steps to appropriately file a levy against you. They must send you a tax bill. If you do not pay this bill by the assigned date, the IRS must send a final notice of levy and a notice of your right to a hearing at least 30 days prior to the levy going into effect. Both notices can be given in person by certified mail. In Illinois, there is a state income tax, which means the IRS can send notice of levy of your state tax return, too. File your taxes on time and pay them in full to avoid a lien or levy being filed against you. If, for whatever reason, you cannot pay your taxes in total, the next best step is to pay what you can and attach a notice to request a specific payment plan—we discussed four different payment options the IRS offers in a previous post. Still not sure what to do about your taxes? It can be a burden to owe a tax debt to the IRS simply because you didn’t know how to file for a payment plan. Interest and penalties can stack up, adding to the total amount owed beyond your tax responsibilities. You don’t have to deal with the IRS alone. Give Tax Law Offices a call today and let us help you put a strategy together to settle your tax debts.